Whether you are starting a new business or expanding your existing business, you will need to choose a business phone system that meets your organization’s requirements. The obvious decision would be to go with what you already know—your service provider from your previous company, or the phone system at your other office location. You could always utilize the system already being used in the building you’re in, but you are then stuck with a solution that might not quite meet your needs—or worse yet, require costly resources to update and maintain. Thankfully, you have options. 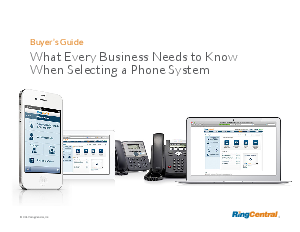 There are several kinds of business phone systems and choosing the right one can save you money, time and effort. The right system will give you a robust and feature-rich system, that can scale affordably as your business grows and your needs become more complex. This guide provides you with essential information and tools so you can understand your options, and make the decision that meets the needs—and ambitions—of your business.